Even magical worlds sometimes have unsolved crimes. As interesting as the descriptions of other parts of the plot were, the food is where the narrator really made me visualize what was happening. Would I want to try everything described in this book? No, but there was something appealing about almost every dish. Figuring out which parts of new dishes were appetizing to me only made me enjoy the storyline more than I already did. There were times when I had trouble keeping all of the characters straight. This was especially noticeable when it came to individuals who weren’t directly connected to the crimes that Randy was trying to unravel.The story simply didn’t have enough room to show what was going on with all of them without also slowing down the plot. While it was definitely a smart decision to keep everything moving, the end result of this was that I wasn’t able to get to know certain characters well enough to keep all of their backstories attached to the right people and creatures. The dialogue regularly made me smile. One of the things I appreciated the most about it was how closely the author tied it to the setting. There are certain words and phrases that make more sense when they’re used in the same room as a goblin, elf, or gnome. I hadn’t even realized that a few of them are so well-suited to these scenarios until I saw how Mr. Hore interpreted them. Once this happened, I only grew to like the dialogue even more than I already did because of how smoothly it all fit together. 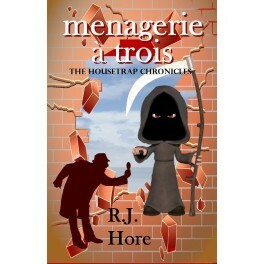 I’d recommend Menagerie à Trois to anyone who enjoys fantasy tales that include a few mysteries to solve as well.